I am still enjoying the memory of my visit to Inverness last week. A major factor in my enjoyment was the hospitality of William and Carine MacKenzie with whom I stayed on Wednesday night. William is an elder of the Kingsview Centre congregation in Inverness. William and Carine are the founders of Christian Focus Publications. The business started 35 years ago when Carine wrote a children’s book. Since then CFP has grown to something like 2000 titles and distributes Christian literature all over the world. There are books for kids, popular titles, historical republications, and academic works for pastors and serious students. Steven Lawson, John Ferguson and me. Last Thursday, I had to hang around for the day waiting for my late afternoon flight back to Birmingham. So William took me up to see the operation, about an hour’s drive north to Geanies House, a working farm near Tain, overlooking the Moray Firth. From this surprising and beautiful setting issues the ministry of Christian Focus. I was not alone on this visit. 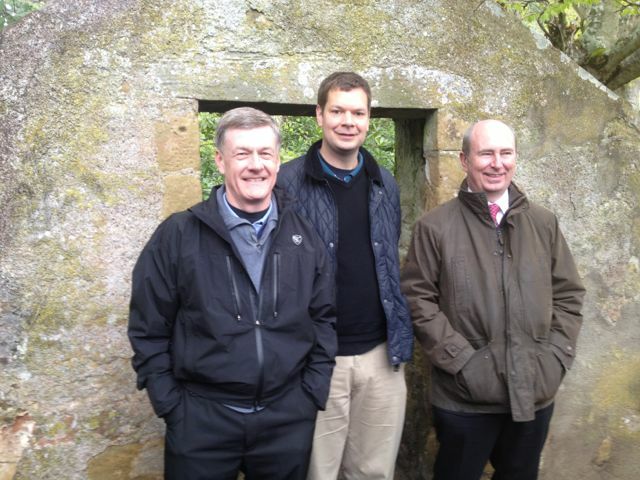 John Ferguson, minister of Kingsview, arrived with Pastor Steven Lawson and his wife and son (see previous post). They were on their way for a game of golf so not only did the car have four people, but sets of clubs too. We had a tour round the grounds and met the staff. William showed us some new titles not yet in the shops. All the time he spoke passionately about the ministry he has served and told some of the stories of lives that have been affected by the books that CFP has published. It was a moving visit. I have to admit that I have not paid much attention to books as part of the ministry at Solihull Presbyterian Church. We have a small book table, but it is not well stocked and only occasionally do I plug anything. However, what with Iain Murray at the Banner conference last month recommending that pastors promote a “book of the month” to congregations and William MacKenzie recommending the same thing independently, I am challenged about it. We are all for promoting the Bible at SPC, but books can be a help to educate, challenge and inspire. 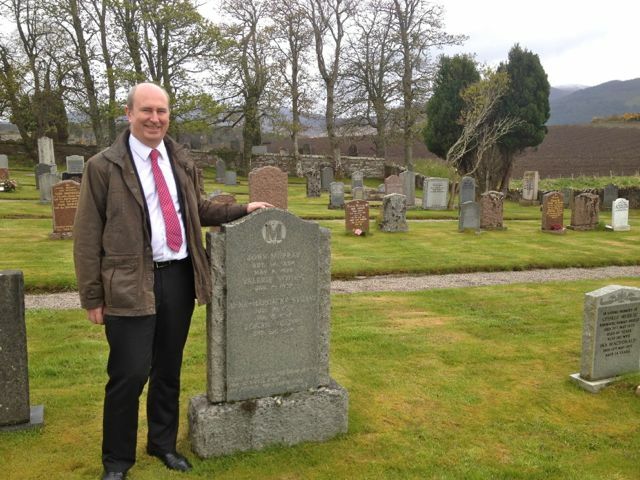 After the others had left to play golf, the final part of the visit was to see the grave of the great John Murray, the Scottish reformed theologian. Murray was one of the key figures in the early days the formation of Westminster Theological Seminary in Philadelphia and in the formation of the Orthodox Presbyterian Church in the USA. He spent most of his years teaching at Westminster before retiring back to Badbea in Sutherland. His body’s final resting place was in a small cemetery by the loch side, near Bonar Bridge. William MacKenzie knows many people in the Reformed christian world as a result of his work. He has many photos of well known visitors to CFP pinned on his wall in his office. Many of them when they visit want to make the journey to Murray’s grave. I have to admit, I don’t have such a pressing fascination. I am interested enough to stop if convenient, but not to make a special journey. However, I had time to kill and William was offering, and it was not too out of the way. The place was beautiful, but the grave ordinary. Perhaps fitting for a man whose life was marked by humility and who put the glory of God as his highest priority. The legacy of Murray is enormous. His work of writing, teaching and preaching gave stimulus to a resurgence of interest in Reformed theology over the last several decades as well as forming the minds of many young ministers across the world. Yet he was a just a man devoted to his Saviour.